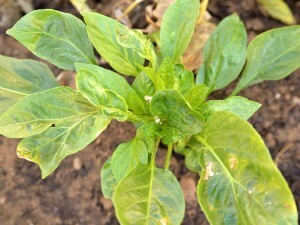 Home > Blog > Gardening > Annuals > What’s wrong with my pepper plant? Hi Chris, My Pepper plant in this photo is looking very sad and I don’t see any nasties on it. But I do notice that the growth tip looks all bunched up. What could this be? I have to say that I have planted at least 8 substantial seedlings in the past six months and they all are not flourishing. I took a photo of the only one that seems to have survived. The others are either dried up or on their way out. Even in the planter, they are not thriving. Perhaps it has been a very hot summer. But maybe it is something else! How are your peppers doing? I really want to get these growing because they are pricey and I would so prefer to grab one from the garden when I really want one! They are better known as Bell Peppers - Capsicum annum - and they come in a variety of colours (red, yellow, green and purple) and the green version is the unripe fruit. They are full of vitamins, nutrients and anti-oxidants! So worthwhile having these growing in the garden. Help! You know you could be right, they seem to be improving. One now has a small blommie. I’m really no expert but that looks like heat damage. On my Gardenias the new leaves often start out like that when its been VERY hot, and as they open they rectify themselves.